We’re into the home stretch of our stats unit and I am looking to reflect upon our study of the normal distribution, yet look ahead at what’s to come – sampling and margin of error. The Rossman-Chance Applets provide some meaningful, interactive discussion starters in statistics. 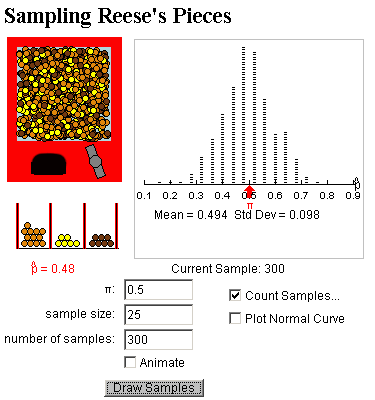 Today, as students entered, the Reeses Pieces sampling applet was drawing random samples of size 25 – displaying the results in a dotplot. Little by little, the dotplot took shape as more samples were drawn…until, eventually, an old friend made an appearance…. Hey, that’s the Normal Distribution! Why yes, yes it is…..isn’t it great that random samping reveals such a powerful statistical concept? But that’s not all. With election day approaching next week, we can start to build connections between random sampling, the normal distribution, and political polling. The parallels are strong, and we’ll talk about them within the next week. With sampling candy, there is a pre-existing proportion of “orange” candy. In a voting population, there is an existing proportion of people who will vote for a certain candidate. With candy, we can draw a random sample of candies. For a poll, we contact a random sample of potential voters. When we sample candy, sometimes we might get 50% orange, or 45 % orange, or 60% orange – variability is part of the game. In political polling, we try to estimate the poroportion who will vote for a candidate, and we hope to get close to the target. Margin of error gives us an idea of how close we are. There are many other interesting discussions to be had surrounding the applets – try some with your classes. They aren’t just for AP kids!